On Sunday, June 14, members of KM joined the hundreds of other Montreal Filipinos at McKenzie King Park to celebrate Philippine Independence Day. While it remains questionable as to whether the Philippines is truly independent, these youth shared in the Filipino pride with their kababayans living overseas. Armed with brochures for the Kapit Bisig Centre, flyers for the Sigaw ng Bayan Radio Show and a press release announcing Neil Castro's run for Youth Director of FAMAS, these youth outreached to youth, the elderly, overseas workers and all members of the Filipino community on a gorgeous Sunday in June. Montreal, Quebec - Local youth leader, Neil Castro, is planning to run as a candidate for Youth Director at the upcoming FAMAS (Filipino Association of Montreal and Suburbs) election on August 9, 2009. 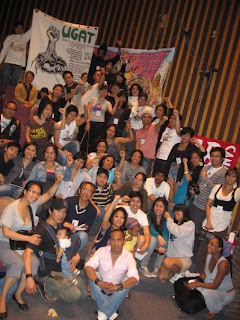 Castro is the current secretary-general of Kabataang Montreal (KM) and has been serving as a youth organizer since 2004. The decision to run for Youth Director is focused on the need to raise awareness on the situation of Filipino youth in Montreal and the implications it has on the Filipino community as a whole. "The Filipino community in Quebec has been in Montreal for over 40 years, yet our youth hold one of the highest drop-out rates in the province," states Castro. "Drop-out rates, among other issues facing Filipino youth, should be the concern of the entire Filipino community. Although KM has been addressing these issues since 2000, it is time for the wider community to become aware and take action as their youth have done." Last month, on the weekend of May 22-24, KM along with the Philippine Women Centre of Quebec and SILKAB Quebec and other member organizations of the Kapit Bisig Centre, held a youth conference under the theme, "Ugat: Sharing our Pinoyville Stories, Understanding our Roots". The conference brought together Filipino youth from high schools, CEGEPS, universities and the community to address the different issues brought out through the experiences of different Filipino youth in Quebec. The Ugat conference succeeded in bringing more young Filipinos forward and work together with KM and other member organizations of the KBC to educate, organize and mobilize the Filipino community in Quebec towards genuine settlement and integration into Canadian society. Kabataang Montreal has been organizing Filipino youth in Quebec since 2000 and is a member of Ugnayan ng Kabataang Pilipino sa Canada/Filipino Canadian Youth Alliance (UKPC/FCYA) since 2006. Neil Castro is also a founding board member of the Kapit Bisig Centre and national council member of UKPC/FCYA. Carlo Sayo, chairperson of the National Formation of the Ugnayan ng Kabataang Pilipino sa Canada/Filipino Canadian Youth Alliance, prepared this short video for the UGAT conference. May 22nd – 24th marked Kabataang Montreal’s “Ugat: Sharing our Pinoyville Stories, Understanding our Roots”, a Filipino intercollegiate and community conference where more than 50 delegates and observers attended. The community-based initiative was an opportunity for organizers, students and youth to share their personal stories of living in Canada, and connect with the predominant issues that Filipinos face in Montreal. It was organized by Kapit Bisig Center and its member organizations Kabataang Montreal (“Filipino Youth of Montreal”, KM), SIKLAB-Quebec (“Advance and Uphold the Rights and Welfare of Filipino Migrant Workers”) and the Philippine Women Center of Quebec (PWC-Q). The event had a three-fold objective of (1) sharing the personal experiences of Filipino youth living in Montreal (2) discussing the issues generally facing Filipino youth in Montreal in terms of their settlement and integration into Quebec society (3) learning about policies affecting Filipino youth (such as immigration, language and educational policies implemented at the municipal, provincial and federal levels). The conference began Friday evening, May 22nd, with an art exhibit and meet-and-greet at the Jewish General Hospital’s Amphitheatre of the Institute of Community and Family Psychiatry (ICFP). Art exhibits included Wing Diocson Yap's art pieces on Philippine Migration and Roderick Carreon's depictions of Philippine migrant labour under the Philippine Government's Labour Export Policy. Neil Castro, Secretary General of KM and conference secretariat, formally introduced the conference by outlining the goals and objectives of the conference. Two documentaries illustrating some of the issues affecting Filipino youth in Montreal were subsequently screened. ‘The Kapit Bisig Center", a short documentary by Krystle Alarcon, followed KM’s successful campaign in lobbying the borough of Cote-des-Neiges to reinstall basketball courts in the school yard of Coronation school, popularly known as “Shaad” and considered by many to be a landmark of the Montreal Filipino community. The next documentary by Marissa Largo and KM entitled ‘Empowerment Through Art’ examined how Filipino youth in Montreal created a mural depicting their lives in the Philippines and Montreal as a way of asserting their identities in Canada. The film showings were followed by a discussion among conference participants. May 23rd, 2009 was the second day of the conference, and featured a full day of activities and workshops. Julie Nieto and Josie Caro of the conference secretariat greeted the crowd and introduced the day’s activities. A cultural performance by Jean-Marc Daga from Ugnayan ng Kabataang Pilipino sa Canada/Filipino Canadian Youth Alliance (UKPC/FCYA)-Ontario was done through a spoken work piece called, ‘My Folks’. This was followed by keynote presentations by Cecilia Diocson, Executive Director of the National Alliance of Philippine Women in Canada (NAPWC), Roderick Carreon, Chairperson of SIKLAB-National and Carlo Sayo, Chairperson of UKPC/FCYA-National. Diocson highlighted three areas that are currently affecting Filipinos in Canada, revolving around the economic, political and cultural realm. She ended her keynote by suggesting that the youth are the future of the community and that we need to get over our so-called “identity crisis” in order for our community to grow. Carreon followed the address by providing a riveting narrative of his experiences integrating and settling in Canada. Accompanied by the guitar and drums of Sinag Bayan Cultural Arts Collective, Carreon recounted the difficulty in adjusting to life in Montreal; particularly in school, where he was forced into an environment that was strange and unfamiliar. Carreon stressed that these challenges are the same ones that Filipino youth face as they reunify with their parents across Canada. Finally, Carlo Sayo presented, via a creative and captivating youtube video, the need for the Filipino community to organize at the national level. Sayo stressed the strides taken to make the Filipino youth count in Canada; among them identifying and addressing the growing challenges to Filipino Canadians. Sayo’s message is for Filipino organizations in Canada to act locally, and to think globally since actions within local organizations contribute to the progression of the UKPC/FCYA-National. The first panel, “Organizing Youth in Montreal”, included presentations by community organizers and academics. Neil Castro gave an overview of KM’s recent campaigns, which started in 1999 until today. He shared his “Pinoyville story”, and what it meant to be Filipino in Canada. He ended his presentation by calling on all the delegates to raise a militant fist in tribute to the founding members of KM, most of whom could not attend the conference because of the continuing marginalization they are still experiencing ten years later. Ilyan Ferrer of KM shared his story as a second-generation Filipino and his struggle to reconnect with roots. He then made an appeal for university students to reconnect with the community by posing a challenge to conference participants: "Now that you know the issues, what are you going to do?" Julie Nieto, Secretary General of the Philippine Women Centre of Quebec shared her stories of being a young woman in the Filipino community. She made an empathic connection of gender oppression and the need for women to empower themselves by breaking the feudal chains that silence Filipino women. The second panel examined the ‘Settlement and integration of Youth in Montreal”. Josie Caro, Board Member of the Philippine Women Centre of Quebec, discussed her master’s thesis on the challenges within the Quebec education system on Filipino youth upon arrival into Canada. Among these challenges were family separation/reunification, lack of accreditation and educational delay due to language barriers. Joanne Vasquez presented on the importance of social services in Quebec, and the lack of access in the Filipino community. For instance, Filipino elders are not accessing services and home services, and are left to rely on their families for support. Vasquez suggested that the Filipino community needs to understand and educate themselves about their rights and entitlements within the social service system – in this way, the Filipino community is able to empower themselves. Joy Alarcon, Board member of the Philippine Women Centre of Quebec, shared her personal stories as a young mother and the challenges of raising her children. She then raised the question of whether Filipina women have choice in a society where women are seen objects or commodities. In response, Alarcon suggested that young Filipina women are able to educate themselves so that current and future generations can empower themselves. Finally, Dr. Joey Bonifacio of the Montreal Children’s Hospital, presented preliminary results of his photovoice project. This was an innovative way to understand the social determinants of health of newly Filipino youth immigrants in Montreal. These allowed Filipino youth to articulate objects or places that made them happy or sad, and to express their stories of integration and settlement. Following the presentations, conference participants and delegates participated in one of two workshops: “Young Women’s Issues” and “Racism”. In these workshops, the intersection of sexism, racism and class were discussed. Participants had the opportunity to identify the predominant issues facing young women, and to define systemic racism and the ways that it affects Filipino youth in Canada. Both workshops offered participants the space and venue to share their personal insights and stories with others while also challenging themselves to identify systemic barriers that impede the growth of the community. Themes and relevant discussion points were then presented to the plenary. The second day of the conference was closed in an enthusiastic solidarity night at Chalet Kent in Kent Park where local Filipino artists, delegates and members of the Montreal community came to share their artistic talents and reflections on the days activities through song, spoken word and music! The final day of the conference opened with a song by Marylou David of UKPC/FCYA-Ontario. This performance was followed by a special presentation by Emmanuel Sayo, who reflected on the notion of multiculturalism in Canada. Sayo provided an overview of the policies that encouraged multiculturalism, and noted how these policies have shifted to take into account integration and settlement of cultural groups. This historical overview was made in connection with the challenges facing visible minority communities. Sayo suggested that linking everyday experiences of marginalized communities with relevant socio-cultural policies in Canada is the proper way to implement notions of multiculturalism. Following this presentation, a film screening of “Pinoyville: CDN”, a theatre project of the Kapit Bisig Centre first presented in Montreal in November 2008 (film by Krystle Alarcon), was presented to the audience. Writers, actors and contributors of the play then participated in an impromptu panel, discussing the development and themes inherent in the play. The second and final workshop session examined “Youth and Education” and “Family Separation and Reunification”. These workshops allowed delegates and conference participants to discuss the barriers within the educational system, and the stories and effects of family separation and reunification. Both groups developed action plans to counter these issues, and identified the Live-In Caregiver Program as one of the major immigration policies behind these issues. Like the proceedings from the first workshop, findings and action plans were then presented to the plenary. The conference concluded with a general assessment of the UGAT Conference. Here, participants and delegates were able to share their experiences and feedback of the conference. Ilyan Ferrer, member of KM and PhD student at McGill said, "I just wanted to say it was very inspiring to hear the stories presented. I used to think we always had to rely on others to give us the rights we deserve but I’ve come to realize that we can take care of our community. That’s one thing I learned today." “UGAT: Sharing our Pinoyville Stories, Understanding our Roots” is a follow up to the 2005 Youth Consultation, and represents the progress made by the Filipino community in Montreal. Delegates shared recent campaigns and strides made within the community, and by organizations like SIKLAB, KM and PWC-Q. In this venue, participants were encouraged to share their stories and to reflect on the experiences that connect the Filipino community in Montreal. With this being said, the conference objectives of sharing the personal experiences of Filipino youth living in Montreal,discussing the issues generally facing Filipino youth in Montreal in terms of their settlement and integration into Quebec society and learning about policies affecting Filipino youth, were met. Activities such as this conference exemplify the capacity building and organizing that the Kapit Bisig Center and its member organizations have made in response to the predominant issues that face Filipino workers, youth and families. Moreover, they show the progress made by these organizations in building toward a multicultural and multiethnic Canadian society. Much needs to be done towards the empowerment and full participation of Filipino youth in society, and these youth are ready to take on this responsibility.